I am so excited to be partnering with Graphic Stock for this project. Not only do I love their images, but they are generous enough to share a free seven day trial with you guys! Check out the bottom of the post for more info! 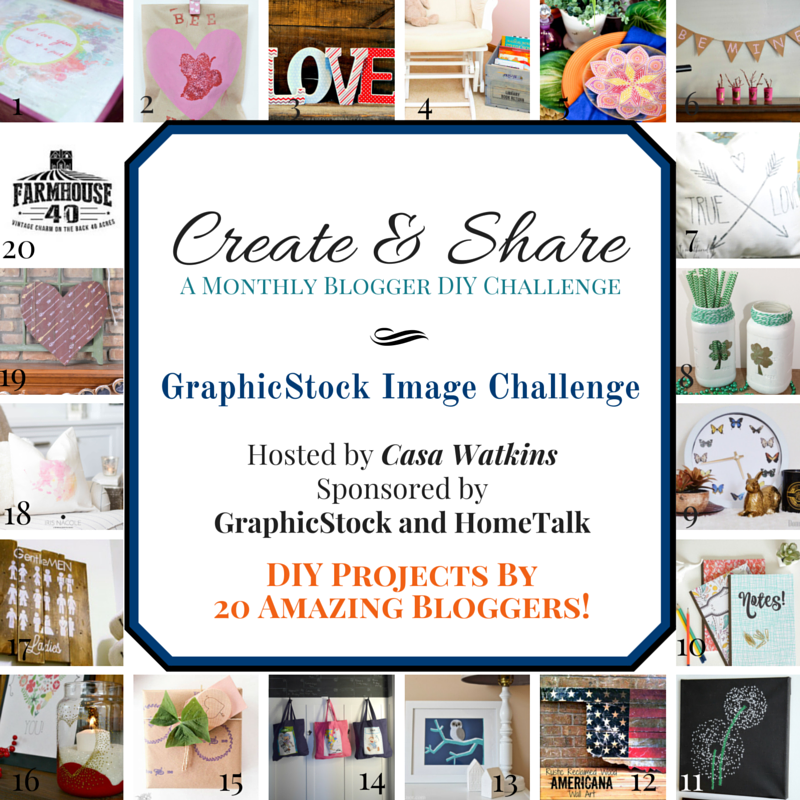 I am teaming up with lots of my blogging friends to all share with you different projects created from Graphic Stock images. You should find tons of inspiration here! My little baby girl is growing up so quickly. She will be four next month, I can’t believe it! As she gets older, the items she needs in her room are evolving. When she was a baby, I was able to stow everything in small boxes and bins. As she gets bigger, I see that that won’t work because she insists on having everything out in the open. I put it in a bin, she dumps it back out. I thought that maybe a tray for her dresser would be more effective. She can throw stuff in it and easily access it when she needs it. I am happy because it is corralled in one spot and she is happy because she can see it! I started with an unfinished wood tray from Joann’s and then painted it with sparkly purple paint. Not my first choice, but I let my daughter pick and she loves it! I then picked up adhesive printable paper. This was actually Silhouette brand but can be used in a regular printer as well. I used this beautiful paint splatter border from GraphicStock.com and added one of our favorite song lyrics. My Mom sang me this song when I was little and now we all sing it to my daughter. Both my Mom and I have this song on a pillow on our beds so now my daughter has a little piece of it too! Feel free to copy and paste this image to use for your own individual purposes if you’d like. Or use this link! I printed it on my adhesive card stock and then stuck it down in the tray. I plan to add a thick coat of a couple coats of hard coat Mod Podge to this but just didn’t get a chance to yet. It will seal the paper from any drips or spills and add a nice glossy finish. You can see that the paper went down slightly bubbly, but I was in a hurry and had two little hands helping me. It certainly isn’t perfect, but she loves it, and that’s all that matters! I would share the finished and staged version with you hopefully next week! The paper was still sopping wet here! Like I said…I somehow got myself into a major time crunch and was hustlin’! Graphic Stock is offering you a chance to try their images for seven days with a free trial. Here is the link to try it Free Trial! Love this tray and so many uses for your daughter. Great job! What a great way to help her get organized in her own special way! Plus its super cute! Thanks for sharing! Pinning! I love that you added the lyric inside the image. It turned out great! Our daughters must be very close in age, as mine turns 4 in the beginning of March! Crazy how quickly they grow up. This is way too sweet! Love how it turned out. I love all the colors and how you tied it all together and the saying on the inside is super cute! This is so cute! I love how it turned out! This is adorable! Love the print and it’s so easy to make. This would be a great gift as well as a school tray. I gather homeschool activities on trays for the kids and this one would be wonderful. Yes! My daughter already asked if we could make one for her grandma for Valentine’s Day! Cute! Actually the purple works well and I love that it’s lightly painted showing the wood grain. Great job! Thanks! Yes, I love that it isn’t painted solid! Amanda, it’s adorable! And what lovely sentiment behind it. I love the image you created!